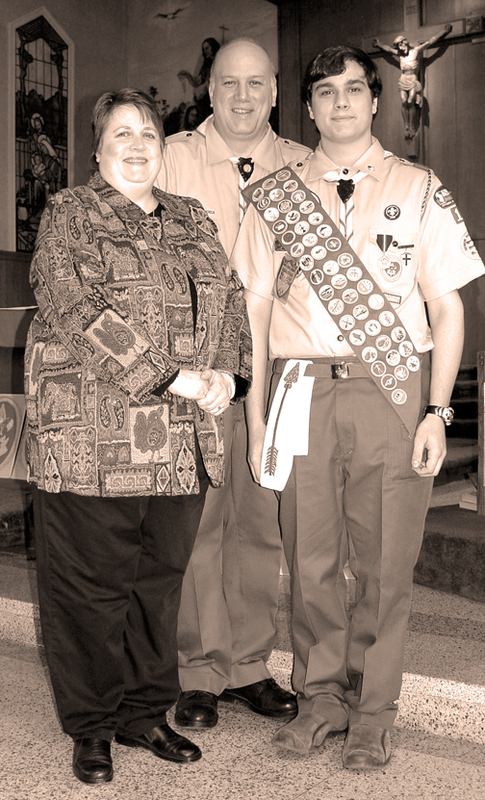 On Saturday, February 11, 2006, Harry Martin Maisch IV was formally awarded the Eagle Court of Honor during the ceremony held in the Corpus Christi Chapel. The program began with the Presentation of Colors, Pledge of Allegiance, Scout Oath and Scout Law by Troop 17 Scouts. James Taranto, Scoutmaster Emeritus, provided welcoming remarks and gave the invocation. Scoutmaster Taranto convened the Court of Honor and Eagle Scout Jonathan Paige escorted the candidate and his family. Kathleen Goldsmith, former Scoutmaster, stated the Boy Scouts of America requirements for Eagle. Robert Lorfink, Troop Advancement, stated the candidates credentials. Kenneth Hess, Scoutmaster Troop 17 presented the US Flag which had flown at the Pentagon Building in Washington, DC. Scoutmaster Taranto stated the Eagle Charge. Ricky Goldsmith, Committee Chairman, gave the Eagle Oath and the presentation of the Eagle Badge. Harry Martin Maisch IV made a presentation to his parents. Many organizations recognized Harry Martin Maisch IVs efforts with various awards, scholarships, etc. (see sidebar). Congratulatory letters were read by John Paige, Treasurer. Harry Martin Maisch IV presented the Eagle Scout Response. The closing ceremony began with a benediction by Fr. Rod; James Taranto closed the Court of Honor and Troop 17 Scouts retired the colors. Mr. Maisch was a member of the Tiger Cubs and progressed through Cub Scouts and Boy Scouts. He was awarded a certificate for outstanding scouting skills as a Cub Scout in Pack 17. He has served as Den Chief, Senior Patrol Leader, Troop Guide and is a member of the Boy Scouts National Honor Society: The Order of the Arrow. He received the Hometown USA Badge and the US Heritage Award. While working towards his Eagle Rank, he obtained 46 merit badges (only 21 are required for Eagle status). His Eagle Project was completed at Woodland Park where he spent approximately 160 hours. He sanded and painted 27 picnic tables, painted the pavilion fireplace on both sides, painted the serving areas and did a general cleanup of the park. He completed his project in April 2005. Mr. Maisch is a lifelong resident of Hasbrouck Heights. He attended Euclid School, Middle School and is attending High School. He is taking advanced classes in high school English and History, is a member of the HH school concert, jazz and marching bands -- he plays piano, saxophone, drums and guitar. His accomplishments include: (1998) awarded Most Valuable Swimmer, (2001) awarded Presidents Academic Award, (2004) one of the HH Middle School students to place a wreath on the Tomb of the Unknown Soldier at Arlington National Cemetery in Virginia, attended Junior Leadership training for a week in the summer of 2004. Other activities he volunteered to help with included collecting for the food pantries all the years he has been involved in scouting, HH Free Public Library Annual Book Sales, cleaned up the facility at the Bergen County Animal Shelter, and cleaned the Ramapo River with Trout Unlimited. Mr. Maisch has been an avid fossil collector since Third Grade. He found a tooth from a giant extinct great white shark Megalodon in South Carolina in April 2005. He has been a member of the NJ Paleontological Society since 1998. Mr. Maisch stated, "I learned many skills in scouting that I will utilize for the rest of my life." He said, "Attaining the Eagle rank required the support of many troop leaders, in particular, Mr. James Taranto, for his selfless dedication." Harry stated, "I plan to finish high school and attend college studying Paleontology and Geology."  United Labor Agency of Bergen County AFL-CIO, James Halloran, S.M.A. Robert S. S. Baden-Powell introduced badges for achievement in his 1908 book, "Scouting For Boys." It is said that Baden-Powell got the idea of awards from the American naturalist, Ernest Thompson Seton, who passed along ideas from his Red Indian Boy Scouts of America. Initially, the highest available rank in Scouting in the U.S. was going to be the Wolf Badge, based on the Silver Wolf badge in Great Britain. However, no Wolf rank was ever awarded. Several leaders who reviewed the proof version of the Handbook for Boys of 1911 thought that the highest award should recognize the American Eagle. So by the time the handbook was published, the highest rank in Scouting in the United States was given its current name - Eagle. While a Life Scout, a candidate must serve actively for 6 months in one or more of the following positions of responsibility: assistant senior patrol leader, chaplain aide, den chief, instructor, junior assistant scoutmaster, librarian, patrol leader, quartermaster, scribe, senior patrol leader, troop guide. While a Life Scout, plan, develop, and give leadership to others in a service project helpful to any religious institution, any school, or their community and take part in a Scoutmaster Conference.